It is a time of darkness where clockwork powers the world. Evil permeates society causing great mayhem, and man’s morals are questioned. Kain, tortured by his past sins, seeks to earn redemption by saving mankind. But can he, whom the gods no longer praise, redeem himself? Pride is an orphan, who along with his brother, got adopted by a high class assassin. Envy is a rich girl who was shipped off to dancing school. Greed was a street urchin who had to become a thief to survive. Wrath worked at a steel plant that made the cogs that turn the town. Lust is a high class French stripper who seems to be in the wrong place at the right time…. all of the time. Gluttony is a baker from the Netherlands who takes a bite out of his problems. Sloth is an ex-opium addict and just so happens to be Greed’s older sister. Then there is Depression who has lived her whole life in a cemetery. My Favorite reward: A $10 pledge gets you a digital copy of book 1. Your adventure takes place in Victorian London 1892, but dark deeds are afoot, the streets seem eerily quiet but you are soon to realize why, the dastardly Professor Rattwurm is attempting to enslave the fine English folk with his army of clockwork automatons raging havoc all over town. The Skillington Arms – A good place for the locals to hide out! Using this new-fangled steam power and some state of the art 19th century gadgetry along with the guidance and expertise of Doctor Obadiah Springhorn you should be more than capable of victory. As you look around the Springhorn’s command centre in the Airship ‘Horndenburg’ you will see the other weapons which will be at your disposal in the full game, but our demo ‘drops’ you right into the action and sees you kitted out straight away with three beautiful weapons, the Steam Hammer, the Steam Cannon and the Magnetic Beam. Tragedy of Progress is a Steampunk Tabletop RPG-Skirmish game which allows players to create custom groups of characters and compete, or sometimes cooperate, with others. Our models are what make us stand out when compared to currently available tabletop miniatures games. We will be offering a selection of 3D printable miniatures players can purchase for a low cost and print themselves, either at home on their own 3D printer, or at a publicly available printer, which can be found in more and more in public libraries. The most important fact about Tragedy of Progress is that the game itself will be free to play for everyone. All the necessary rules, instructions, and items (such as basic dice) will be posted online once the game is complete and will be freely available for download and use. 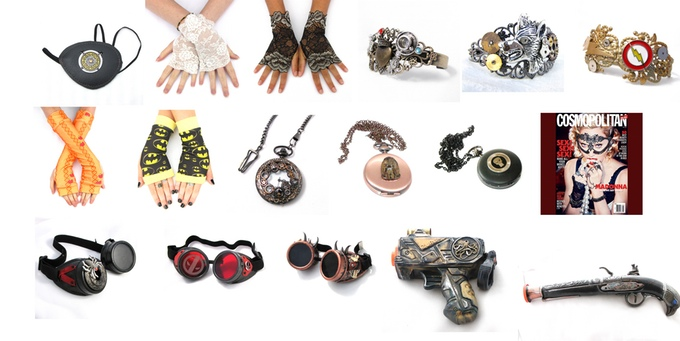 Steampunk Wolf runs a successful online shop as well as an Amazon Handmade Store. Steampunk Wolf is ready to expand our brand. We are offering some amazing costume accessories to potential pledges, many in time for Halloween. My Favorite Reward: $20 pledge gets you your choice of geeky fingerless gloves in a variety of fandoms. As the Curator at The Mysterious Package Company I have told many stories, but today I don’t want to tell you a story. Rather, I want you to experience one! It is a story about a house and its many guises: a family residence, a clinic, an illusionist’s abode, and a club of ill repute. This house harbours a type of madness, a mystery that taints the lives of all of its inhabitants. It began with secrets and shame, but where will it end? My Favorite Reward: For a $15 pledge you can get a collection of stickers from different stories they’ve done in the past.